A giant meteor may have exploded over Alaska thousands of years ago, shooting out metal fragments like buckshot, some of which embedded in the tusks of woolly mammoths and the horns of bison. Simultaneously, a large chunk of the meteor hit Alaska south of Allakaket, sending up a dust cloud that blacked out the sun over the entire state and surrounding areas, killing most of the life in the area. Embedded iron particles surrounded by carbonized rings in the outer layer of a mammoth tusk from Alaska. 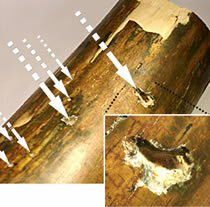 Inset photo shows how an object ripped through the tusk. Image courtesy Richard Firestone. Such is the scenario envisioned by Rick Firestone, a staff scientist at the Lawrence Berkeley National Laboratory in California. Firestone and his colleagues have found mammoth tusks and a bison skull with nickel-rich iron particles in them on one side, suggesting the metal fragments all came from the same direction. Firestone's theory emerged when his colleague, Alan West of Dewey, Arizona, saw at a Phoenix gem and mineral show a mammoth tusk peppered with tiny bits of metal. Intrigued, West and Firestone looked at tusks owned by the same dealer in Calgary. By passing a magnet over mammoth tusks in Calgary, Firestone and West found seven mammoth tusks collected somewhere near the Yukon River and a bison skull from Siberia that had tiny iron fragments burned into them. The fragments also contained nickel. "One in 1,000 tusks had this material in it," Firestone said. Firestone also thinks he may have found the divot left by the ancient meteorite, an impact crater that is now occupied by a round body of water named Sithylemenkat Lake in the upper Kanuti River drainage. A meteorite that big would have torched anything within a 100-mile radius and could have buried the mammoths farther away from the crater, preserving the tusks struck by metal fragments. Firestone said the dust kicked up by the meteor would have eliminated any mammoths that survived the meteor's hit. "There was probably 10,000 years with no mammoths," he said, adding that other mammoths eventually migrated back into Alaska. Buck Sharpton, an expert on impact craters and the Vice Chancellor for Research at the University of Alaska Fairbanks, said the lake would have to be much older than 35,000 years because it has no rim associated with more recent impact craters and doesn't look to him like an impact crater. He thinks the iron bits in the tusks could be cavities filled by "being immersed for millennia in porous sedimentary fill through which iron-rich water percolated." As for Sithylemenkat Lake, Gordon Herreid didn't mention a possible meteorite impact when he wrote a 1969 geology report on the lake for the state (which ordered the investigation because of possible nickel deposits there). Jan Cannon wrote in the journal Science in 1977 that the lake looked to be the only visible impact crater in Alaska based on a study of Landsat satellite images. One year later, William Patton of the U.S. Geological Survey argued in Science that glaciers, rather than a meteorite, created the lake. This column is provided as a public service by the Geophysical Institute, University of Alaska Fairbanks, in cooperation with the UAF research community. Ned Rozell is a science writer at the institute.